When you have locations that span across the country, it can be a real challenge to keep track of all the different provincial regulations. Humaniqa gives you access to all of the most current regulations, interpreted in a way that’s easy to understand and free of legal jargon. Managing the recruitment and selection process is crucial to the effective operations of an organization but can be a challenge. Use our comprehensive Recruitment and Selection Guide and complimentary training video, as well as, our inventory of templates to help you hire and retain the right individuals. With NORCAT’s Internet-based safety courses, your classroom is open 24 hours a day, 7 days a week. Employee training has become easier than ever, while maintaining the highest level of quality and record management. Your employees can instantly and easily take advantage of all the features our reliable online training programs have to offer. We offer preferred pricing for a host of occupational health and safety courses, such as WHMIS, AODA and Workplace Violence and Harassment. Need Help On New Legislation? Let Humaniqa and our team of Certified HR Professionals help you stay on top of the ever-changing employment legislation for all federal and provincial jurisdictions across Canada with our complimentary webinars, unlimited access to our highly-qualified HR team and our library of resources! A well-written handbook can help your company manage employee expectations, improve employees’ understanding of company policies and provide some protection against employee complaints. Having an up-to-date handbook is an HR best practice that often gets pushed to the bottom of the “to-do” list due to lack of time and resources. We understand your time is limited, so this is why we have created our easy-to-use Employee Handbook tool. Simply by answering a series of questions, you will be able to create your company’s very own Employee Handbook in minutes. The questionnaire will collect information specific to your company and pre-populate the different areas within the Employee Handbook based on your jurisdiction. Once completed, the system will generate a standard handbook that can be used for all newly hired. It’s hard to juggle multiple job roles, especially in small to medium sized enterprise. Humaniqa allows you to take control of your HR and assists you with managing your human capital, protecting your company and preventing future errors that could jeopardize your business. What is Your Latest HR Concern? 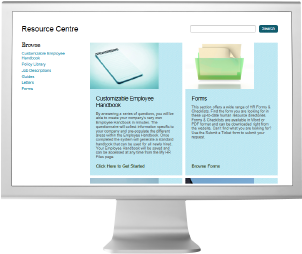 Our templates and HR resources are available in both English and French, saving you money on translation fees! Employee training has just become more efficient, cost-effective, and centralized than ever, while maintaining the highest level of quality and record management. In partnership with NORCAT, we offer a variety of online training courses, such as WHMIS, Workplace Violence and Harassment and AODA at discounted prices. Create your own employee handbook – a task that often gets set aside either because it’s too expensive or too time consuming to produce! By using our unique employee handbook tool, you’ll answer a few questions about your organization and, within minutes, you’ll have a fully-customized employee handbook to help you guide employee behaviour. Complete the online HR Audit and within minutes receive results that can give direction on how to optimize your HR initiatives. The Audit takes a close look at the size, type of employees and current HR strategies being deployed within your organization when making recommendations. Never lose an important employee document again. Store your HR documents in My HR Files and access them anywhere you have an Internet connection. Humaniqa can help you stay on top of the latest HR management techniques through our free webcasts and online Management training videos designed to address your day-to-day HR needs and challenges. If you are interested in partnering with Humaniqa, contact us today!